These days everyone seems to want to hop on the “Rogue-Like” bandwagon. It’s a genre of game that has seen an explosion of titles in the last four years thanks to indie developers and titles like FTL, Binding of Isaac, Dungeon of the Endless and many many more. All of these games share a few traits - a strong death penalty, randomized gameplay, and lots of replayability with RPG-lite elements. With such an influx of titles though, games have to do a lot to set themselves apart from the competition. That’s where Enter the Gungeon comes in, a game that most likely started out as a drunken game development joke and soon was realized it could be a fully fledge twin-stick rogue like game about shooting bullets at bullets shooting bullets at you. 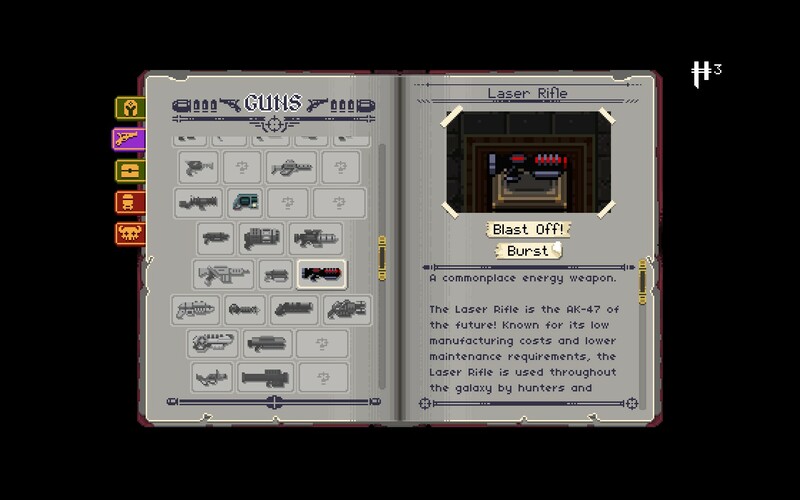 The story of Enter the Gungeon was inspired by Dan Simmons 1989 book “Hyperion” - you travel into the dungeon as one of four heroes to try to acquire the gun that can kill the past and undo one of your character’s mistakes in life. With four characters to play there are not only four unique endings, but four different final bosses to face. The four characters all play a bit different initially, mostly due to their arsenal. The Marine starts with armor and a gun with a fairly low rate of fire (but faster reload speed) as well as the ability to call in ammo. The Pilot has a slightly better gun with infinite ammo and a lock pick utility item. The Convict starts with a pistol and shotgun and also carries a picture of the shopkeeper for some reason. The Hunter has a standard gun, crossbow and a pet that reveals room items on completion. The biggest difference between the characters for me was just how they felt with their starting weapon, though you quickly look for something better within the dungeon itself. 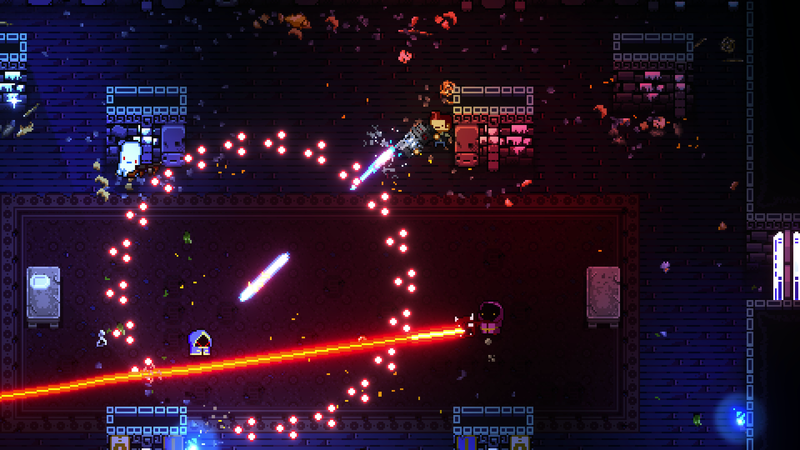 Gameplay in Gungeon is part twin stick shooter, part SHMUP, part rogue-like. While character control is very twin-stick like, bullets come at you in patterns similar to those found in SHMUPs. 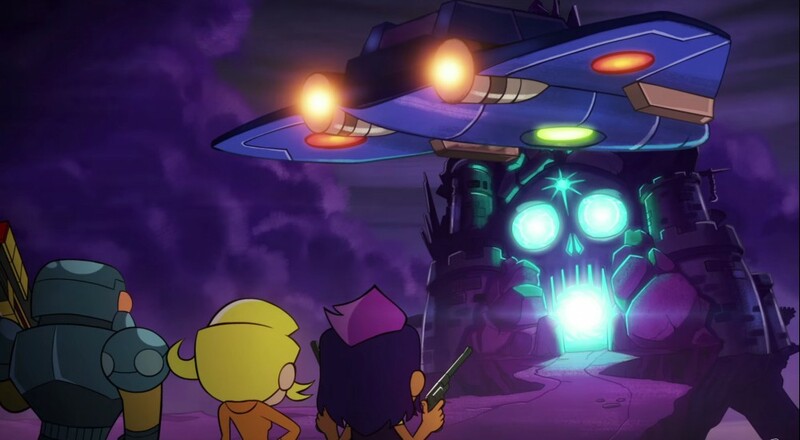 The dungeon itself is randomized so you’ll go between rooms, flipping tables for cover, and firing bullets at bullets (and other enemies to be honest) while destroying lots of random items in the room like books, trees, chairs, vases, and more. Finally there is the dodge roll mechanic - inspired by Dark Souls - where rolling avoids all damage. Combine all the elements and it’s a careful orchestrion of button presses, timing, pattern memorization and chaos with each and every level. I feel like the team at Dodge Roll was trying to capture the feel of a John Woo fight scene with how each room plays out. There’s also a good variety of enemies you’ll go up again, sure you have bullets that shoot bullets. But you’ll also face off against books that shoot bullets, wizards that shoot bullets, and slime molds that shoot slime molds. The bosses are inventive and challenging, defeating them yields a sense of satisfaction (and loot), and their placement is randomized based on the depth in the dungeon. It should be no surprise that guns are the focus of Gungeon, but it’s not just the shooting of the guns you’ll be doing. The progression in the game is about collecting all of the game’s 190 available guns. These guns range from the standard like shotgun or Tommy gun to the zany like T-Shirt launcher, Trident, Snowball Gun, or one that has heat seeking eggs (I think?). It’s finding these guns hidden throughout the levels in chests that truly help you progress. Combined with over 200 items to use and you’ve got a fully loaded arsenal at your disposal to rain bullet hell. Not all of these guns and items are accessible via the game at first. You’ll collect a currency with each dive into the dungeon that can be used a shop in the breach to permanently unlock access to the rarest of these. All this is tracked in an almanac in the game and serve as your marker of progression. The shop itself is only unlocked after saving the shopkeeper from level two in the dungeon, another manner of minor progress. Gungeon feels ripe for co-op. But it’s kind of clear it was added later in development instead of there from the get go. To play co-op you need to start a game, then talk to the character in the purple robes in the breach. He becomes player two and joins you for your run. Sadly this means you can test strategies of different characters in the game, and it also means there’s no online co-op. Co-Op play itself is even more chaotic, and at times, a bit cramped. It’s hear you can see that sometimes a room wasn’t quite made for two people, so you end up colliding with flipped objects, walls, or simply falling into a pit in the floor because you are busy concentrating on all of the chaos. In a way it almost slows the game down. Enter the Gungeon has all the makings of a solid game, but I can’t help but feel like something is missing. Perhaps the progression element isn’t strong enough for me, or I needed to be nudged just a little more; whatever the case may be I feel the carrot on the stick isn’t quite big enough here. Couch co-op is a good time in short bursts, and while it can be frustrating, it often yields to hilarious results. That’s not to say the game isn’t fun, you’ll definitely have a good time shooting bullets at bullets shooting bullets at you. 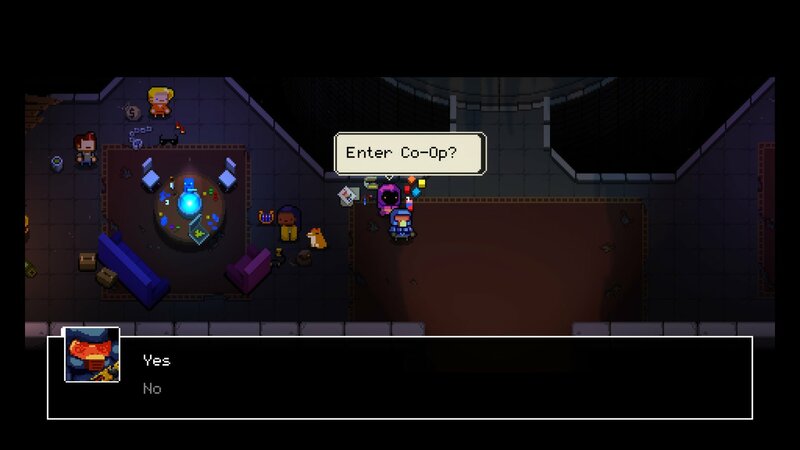 The Co-Op Experience: Two players shoot through the gungeon, one bullet at a time. To start co-op, make sure you have two controllers active and signed in, then speak to the character in purple robes standing to the right of the character select.